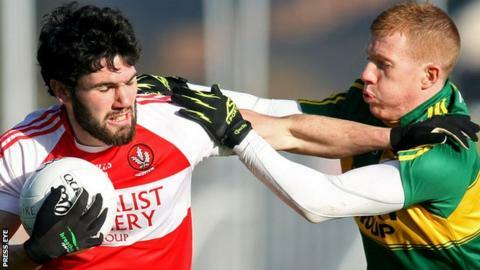 Derry had captain Mark Lynch sent-off as they fell to a seven-point defeat by an understrength Kerry team in Sunday's Division One clash at Celtic Park. The Oak Leafers will argue that Lynch's red card for a high challenge was a harsh decision but they can have no complaints about the result. Full-forward Paul Geaney scored the Kingdom's goal plus six points while Brian Sheehan scored seven frees. Derry are now the only team in Division One without a point this year. Brian McIver's men are away to Tyrone in their next match in three weeks' time and desperately need a result in their quest for top-flight survival. "We did not have the cutting edge up front, while their finishing was tremendous," admitted Derry manager Brian McIver. "But their goal should not really have been scored." McIver has a point because the goal scored by McGeaney came from a Derry mistake as they tried to take the ball out of defence. And it effectively killed off the 14-man Oak Leafers as it left them facing a 1-14 to 0-11 deficit. Derry, trailing 10 points to seven at the break, cut the gap to just one thanks to two frees by interval replacement Eoin Bradley. But a Sheehan free and two scores from play by Geaney saw Kerry pull away before Lynch's red card and that match-clinching goal.